If you’re already rocking a jailbroken handset by way of Electra or unc0ver, then you should consider yourself lucky. Unfortunately, those who updated to iOS 11.4-11.4.1 or iOS 12.0+, either on purpose or by accident, can’t jailbreak at this time. 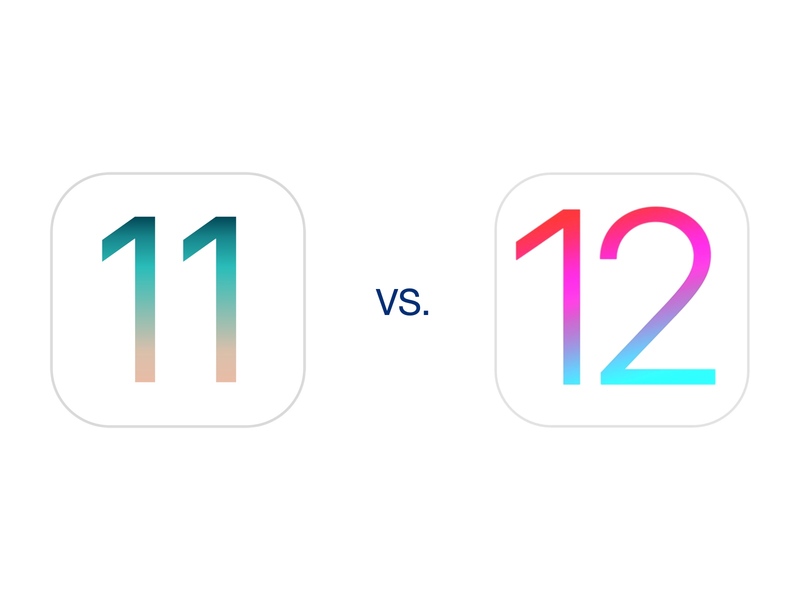 If you fall into the latter category and have been crossing your fingers for a jailbreak, then you might be asking yourself whether you should stay where you are or upgrade to iOS 12.1; that’s a question we intend to help you answer in this piece. Like with most pieces of software, older iterations of iOS tend to have more security holes than newer ones. 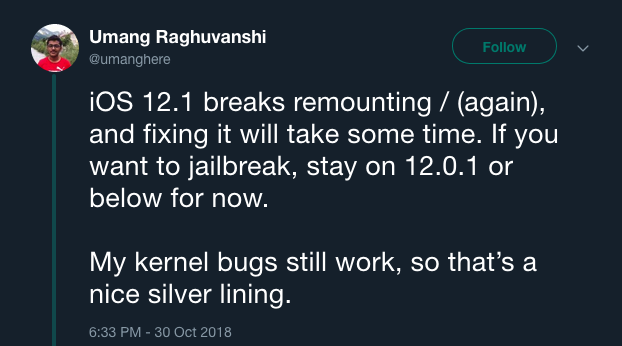 Hobbyist hacker @s1guza says it best when he mentions that iOS 12 has seen a lot more security patches than iOS 11.4-11.4.1, so sticking with the lowest possible firmware should theoretically increase your chances of seeing a jailbreak sooner rather than later. Currently, unc0ver supports all iOS versions between iOS 11.0 and iOS 11.4 beta 3 (which excludes iOS 11.4 public release). It’s entirely possible that unc0ver could one day be updated to support iOS 11.4 and 11.4.1 with the proper exploit support, so that’s something to keep in mind. Ian Beer released a plethora of iOS 11.4.1-centric exploits in the middle of October, but they have yet to be introduced to any mainstream jailbreak tool. Given what we know, the most logical choice at this time appears to be staying on iOS 11.4 or 11.4.1 if you’re currently already there. What if you’re already on iOS 12? If you’re already on iOS 12, then all hope is not lost. KeenLab recently demonstrated a jailbreak on an iPhone XS Max running iOS 12.1, and while it’s unlikely to be released to the public, it still validates the idea that iOS 12 can be jailbroken. Several high-profile security researchers like Ian Beer have recently shifted focus to iOS 12 instead of iOS 11. With that in mind, it’s entirely possible that the days of jailbreaking iOS 11 have peaked and that the next major jailbreak could encompass iOS 12 instead. 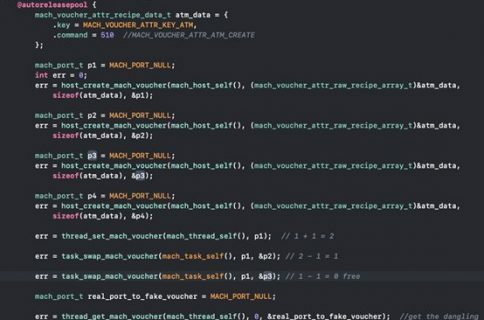 Beer hasn’t publicly announced any new iOS 12-centric exploits since he announced that he’d be working on iOS 12 going forward, but other underground hackers appear to be picking up some of the slack. Even if you’re on iOS 12 already, the advice provided by hobbyist hacker @s1guza still holds true: staying on the lowest-possible firmware increases your odds of being able to jailbreak in the future. That said, if you’re on iOS 12.0 or 12.0.1, then you should consider blocking future updates by installing the tvOS profile on your iOS device. You’ll find what you’re looking for with a quick Google search, but we can’t link directly to it in this post for legal reasons. As of this writing, there are exploits in the wild for both iOS 11.4-11.4.1 and iOS 12.0-12.0.1, but exploits alone aren’t the entire story. Creating a jailbreak tool often requires more than one exploit, and it also requires a crafty developer who is willing to build a GUI-based jailbreak tool and maintain it after bugs are reported. If you’re on iOS 11.4-11.4.1 right now, then we recommend staying where you are until further notice; likewise, those on iOS 12.0-12.0.1 should also stay where they are. 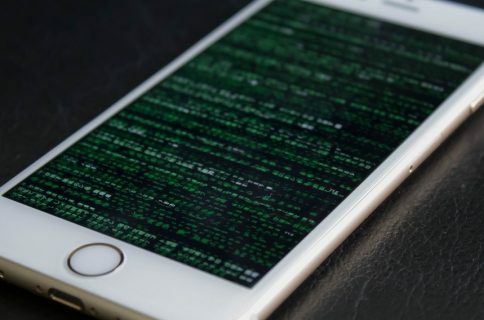 iOS 12.1 patches most known exploits for Apple’s mobile operating system, so it’s unlikely that we’ll see an iOS 12.1 jailbreak unless a high-profile security researcher like Ian Beer drops a bombshell exploit in the future. 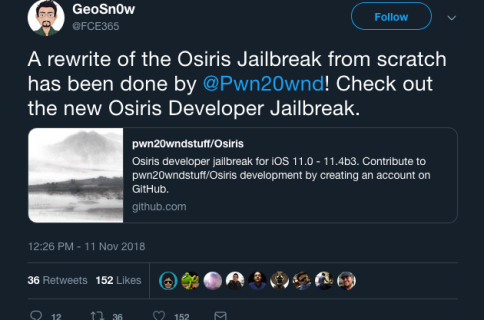 Are you already jailbroken with Electra or unc0ver, or are you waiting patiently on an unjailbreakable firmware for a jailbreak tool to be released? Share in the comments section below.